Last edited by The_Dr_B on 2013-Mar-27 9:03 am, edited 4 times in total. My first thought was that 34 lands is very low especially with such a bunch of expesinve and/or mana hungry creatures. Imho cut some of the weaker pingers and go up to at least 36 lands and add more mana artifacts. Second thing to notice would be the lot of blue hate you play, seems like your meta is overwhelmed by blue control decks, countering and stealing your spells? 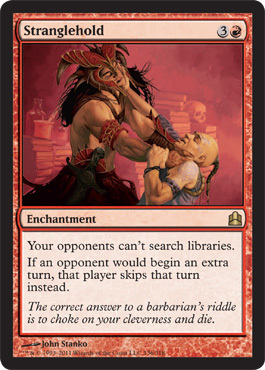 If that's really the case you should consider, or almost auto include this card from the upcoming Commander decks. Sword of Kaldra, it's like Basilisk Collar, a bit expensive, but can also make a big beater out of any creature you have. Also if you add the Sword, Shield of Kaldra and Helm of Kaldra are also worth to consider. Thornbite Staff would add to the pinging theme, also a lot of your pingers a shamans. Also Grafted Exoskeleton is just great with Kumano and so many other Pingers. Sword of Feast and Famine is also great with Kumano on the battlefield and another card to protect him. Godo, Bandit Warlord is great for tutoring all these equipment, and an incredible beater. Hoarding Dragon is another great red tutor, and tutors in red a rare thing. Kiki-Jiki is another great goblin to add, but this depends on how many enters the battlefield effects you play imho. Stingscourger is another Goblin to be considered. Inferno Titan is an on theme beater, that synergizes well with some other cards in your deck. Think about Tormod's Crypt and Relic of Progenitus to add some graveyard hate to your deck. Also Mimic Vat is a kind of Graveyard hate. In some playtesting, the lands have been ok. I haven't been able to play this live very much, which would be the real test. I have a pretty diverse meta, but there definitely are quite a few control decks floating around. If I get a match without one, I'd probably consider another deck. And (as you could probably tell) there are just tons of artifacts in most decks I see. I'm trying to avoid mana artifacts and equipment as much as possible so as not to inhibit my artifact hate. The artifacts I have are a bare minimum for that reason. I'm not sure on the goblin tutors as my goblin count is pretty low. Stranglehold is ABSOLUTELY going in. It's amazing for this deck, and globally. goblin welder and inferno titan would both be great, if I can trade for them. I did just get a mox opal and a spellskite at last week's FNM, so I do have some trade ammunition. By my count, you have 10 artifact hate cards in your deck right now. Now, maybe your meta requires that, and the wellsprings help with that, but I think I'd rather have a Mind's Eye or Candles of Leng or something to draw. Then again, if the idea is to not soak up so much mana, then I'm sure there are alternatives. Seer's Sundial, Grafted Skullcap, Urza's Blueprints. Also, as far as the artifact destruction itself goes, maybe replace one with something that can hit something besides artifacts, like Pillage or Aftershock (a personal favorite of mine, especially in mono-red). There are others, like Fissure Vent or Icefall (which could interact well with Kumano, but that depends. Sure, you generally control when creatures die, but do you really want to have repeatable land destruction? Again, it depends on how cutthroat your meta is, but I can imagine this getting very mean very quickly. Strata Sycthe is great in any mono-colored deck that ever attacks, and is especially nasty with Balefire Dragon. Um, other than that, looks pretty good. The artifact hate is definitely a theme overall, which makes running artifact draw engines a little iffy. My meta has certain archetypes that the excessive hate excels against. I don't want to run LD. In general, I think of that as far more un-fun than artifact or creature hate. I got some nice legends over the last few months to add to this. Goblin Sharpshooter is amazing, and I can't wait to see if Goblin Welder is as good as I think it is.